“[I]f we suppose our contractors to be in a sensible degree not ‘economic’ agents, but actuated in effective moments by a sympathy with each other’s interests […] we might suppose that the object which X (whose own utility is P) tends […] to maximize is not P, but P plus λπ, where λ is a coefficient of effective sympathy.” Francis Ysidro Edgeworth, Mathematical Psychics, An Essay on the Application of Mathematics to the Moral Sciences, London, 1881, page 53. Do diversified investment vehicles―especially index funds―diminish competitive pressures in concentrated industries? There is an active (and contentious) debate among researchers, policymakers and practitioners about the costs and benefits of such “common ownership.” The idea that firms take account of others’ profits (in addition to their own) is an old one (see the opening citation from Edgeworth). But the current common ownership (CO) debate became active only following recent work reporting that diversified shareholdings of institutional investors led U.S. airlines to raise ticket prices (see Azar, Schmalz and Tecu). Research into the impact of common ownership—and the associated debate—is now intense. In addition to a rapidly growing number of industry-level studies—looking at airlines, banking (here and here) and ready-to-eat cereals (Backus, Conlon and Sinkinson, forthcoming), or at broad groups of industries—other researchers have sought to link common ownership to macroeconomic phenomena, like the weakness of post-crisis investment. And, in response to the anti-competitive claims, legal scholars propose using antitrust law to limit the holdings of institutional investors in oligopolistic industries or to limit share-voting privileges. Against this background, competition authorities in Europe and the United States are taking the debate seriously (see, for example, the FTC hearing held in December at the NYU School of Law). Our own view is that the discussion remains at a very early stage, and that it is likely to take years to resolve whether CO, especially through index-tracking mutual and exchange-traded funds, meets the cost-benefit test (for a skeptical view of CO, see here). Importantly, even if CO does reduce competitive pressures, we currently know far too little about the scale or scope to identify remedies that would be most effective and least disruptive. For example, is there a difference in the anti-competitive impact arising from intermediaries that acquire assets for their own account, from those that actively manage assets on others’ behalf, and from those that merely mimic broad benchmarks to facilitate low-cost diversification for their clients? Some proposed remedies by those who see a problem, such as industry-specific limits on institutional shareholding, would constrain all these activities. Furthermore, should the case for broad-based anti-competitive effects become compelling, any response will need to consider the welfare trade-off between the very large consumer benefits arising from broad index funds (see the opening citation from Bogle) and the consumer costs associated with a loss of competition in selected oligopolistic industries. Against this background, we welcome two new papers (here and here) by Backus, Conlon and Sinkinson (BCS) that review the literature, provide new data to characterize the evolving pattern of share ownership, and suggest a back-to-basics approach for testing the CO hypothesis in specific industries. We hope that their work will spur a wave of CO research that will help us weigh the increasingly animated claims and counter-claims. In the remainder of this post, we highlight a few of the lessons from this recent research. We start with the key trend that is at the foundation of the common ownership debate: the dramatic rise of diversified mutual and exchange-traded funds. During the course of this century, data from the Financial Accounts of the United States show that the holdings of domestic equities through these funds rose from $3.4 trillion in 2000 to $10.3 trillion as September 2018―consistent with a gradually rising share of overall market value. As shown in the chart, the Investment Company Institute Factbook shows a similar increase in the overall share. Accompanying that rise is the surge in index funds (gray bars); in contrast, actively managed funds (blue bars) failed to keep pace with the overall market. Source: Based on figure 2.8 in 2018 Investment Company Institute Factbook, page 42. People who worry that the rise of institutional ownership reduces competitive pressures have both active and passive funds in their sights. The hypothesis is that the managers of the firms in which the institutions invest internalize the interests of the clients of the largest asset managers, regardless of whether the funds themselves are designed to mimic broad indexes (so that they hold substantial equity shares of all firms in a range of concentrated and unconcentrated industries) or not. The advocates of the CO hypothesis point out that large asset managers participate in proxy votes, and also engage with these firms on issues of governance and executive compensation. But the question remains: Do the managers of broad index funds have an incentive to boost prices (and profits) in one industry—often at the expense of other industries? Indeed, even if, by helping to diminish competition within industries, they could raise the profitability of many listed firms, how can they outperform other broad-index asset managers if all have the same objective of mimicking the index? To investigate the CO hypothesis, BCS examine firms in the S&P500, which accounts for roughly 70% of total U.S. equity market value. To highlight the evolution of CO in the United States, BCS collect quarterly data from large institutions’ SEC Form 13(f) filings. For each firm in the S&P500 on each date, they calculate the portion of the shares in the index held by institutions—including hedge funds, insurance companies, and other large institutions, as well as mutual and exchange-traded funds—that exercise discretion over $100 million or more in assets. The next chart shows the dramatic result: institutional holdings surged from about one-third of the S&P500 at the start of 1980 to more than 80% in 2017. For the period after 1999, BCS show increases of similar scale of institutional holdings in the concentrated airlines, banking and ready-to-eat cereal markets (see Figure 4 here). These data lead to the very important conclusion that the rise of institutional holdings is not a new phenomenon; it has been going on for at least four decades, and pre-dates the post-2000 surge in index-fund holdings. 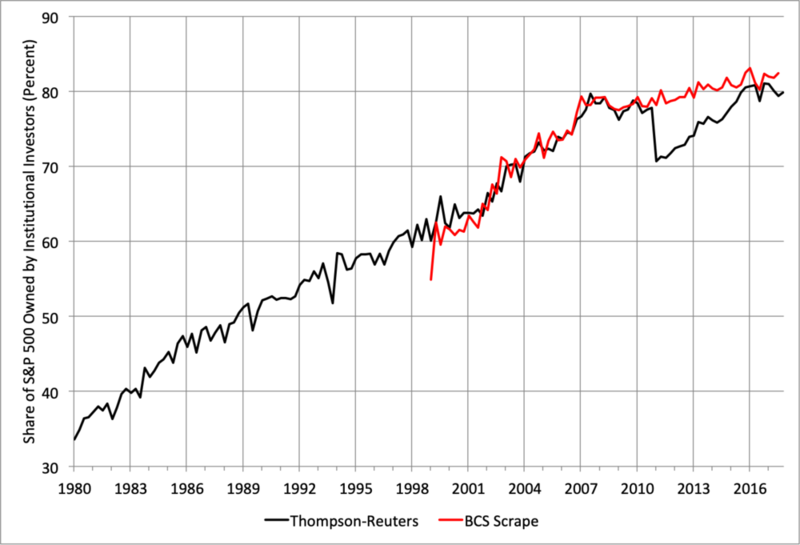 Note: According to BCS, their scraped measure seeks to address previously identified issues with the Thompson-Reuters data, including the plunge in 2011. Source: Figure 4, Backus Conlon Sinkinson, Common Ownership in America: 1980-2017. Beyond new data on equity ownership patterns, BCS introduce a simple metric for measuring the degree to which common institutional holdings can lead the underlying firms to consider the profits of others, such as the profits of their industry rivals―what we might term the “Edgeworth phenomenon”—in making decisions about prices, quantities, investment, R&D, and the like. To understand why this is so important, note that, to date, research on the competitive effects of CO relies primarily on metrics of industry concentration―specifically, the Herfindahl-Hirschman index of market concentration, modified to take account of institutional shareholding (MHHI). The idea is that large institutional holdings increase the effective concentration of an industry, diminishing incentives for firms to compete. However, such analysis is suspect: for example, since firms choose quantities, then market shares―and hence the components of the MHHI―are equilibrium outcomes, so the correlations may be uninformative. Put another way, these analyses face the same statistical challenges one encounters when trying to figure the degree to which movements in market prices and quantities arise from shifts in demand or changes in supply. To provide a theoretically sound alternative, BCS go back to basics. They start by assuming that a firm maximizes shareholder value, knowing the extent to which its investors also hold shares in other firms. As BCS show, this implies that, in making their various decisions about prices, production, investment, research, and the like, each firm places a weight on the profits of other firms. Furthermore, these “profit weights” depend on the structure of ownership. To see why, consider two polar cases, one where a firm has a single owner, who owns nothing else. That firm will place zero weight on the profits of its competitors. At the other extreme, consider a firm that purchases its competitor, so that there is full common ownership. In such a merger, the “common owner” will place an equal weight of one on the profits of the two (now combined) firms. Unlike MHHI, BCS profit weights do not depend on product market share, avoiding the statistical pitfalls mentioned above. The next chart shows the evolution of the average BCS profit weight computed pairwise for all of the firms in the S&P500 (that is, more than 100,000 pairs). Once again, we see a dramatic increase over time, with the average profit weight rising from about 0.2 in the early 1980s to 0.7 in 2017. If the CO hypothesis is correct, BCS estimate that this trebling would result in increases in price mark-ups above marginal cost comparable to those observed in recent decades (see De Loecker, Eeckhout and Unger). Note: The mean excludes the own-firm weight, which is normalized to 1. Source: Figure 1, Backus Conlon Sinkinson, Common Ownership in America: 1980-2017. BCS show that the profit weights can rise for two reasons: growth in ownership concentration of some shares relative to others or increases in portfolio similarity. They identify the latter—the increasing similarity of portfolios—as the top driver. While this pattern is fully consistent with the rise of CO, it was far advanced by 2000, when indexing at large firms like BlackRock (for which about 90% of equity assets are in index funds; see Novick) and Vanguard took off. Aside from portfolio similarity, profit weights also tend to be higher for firms with large market capitalization (probably reflecting larger holdings by retail investors: because these investors are individually small, the higher retail share arithmetically enhances the control rights of large, diversified investors). Of course, BCS profit weights are no panacea. To test the CO hypothesis in a specific industry, BCS still face the classic problem of defining the market and developing a structural model that allows a careful, robust identification of the forces that determine supply and demand. However, for industrial organization specialists (which we certainly are not), this is a familiar challenge that has been addressed in countless structural models in recent decades. The forthcoming BCS paper on the ready-to-eat cereal market uses such a structural approach, and finds no support that common ownership is driving up the price of Wheaties (aside from spurious results when using the reduced-form approach that dominates this prior literature; see here, page 21). The bottom line: with the ongoing trend toward indexation favoring even greater similarity of portfolios and a further expansion of the largest index firms, the debate about common ownership is almost certainly here to stay. Other trends, like increasing concentration of production across the economy, rising mark-ups, slow productivity growth, and the declining labor share of income will only reinforce the interests of researchers, policymakers and practitioners. Our hope is that going forward, research focusing on identifying and measuring causal links, not just estimates of simple correlations, will inform the debate about the competitive effects of common ownership. And that, until our understanding is far more advanced, policymakers will refrain from implementing remedies that could easily be worse than the as-yet uncertain disease. Acknowledgements: We are especially grateful to our friend and Stern colleague, Chris Conlon, for extensive discussions regarding common ownership and for sharing data from the BCS papers. We also thank Yossi Spiegel and Larry White for very helpful suggestions.